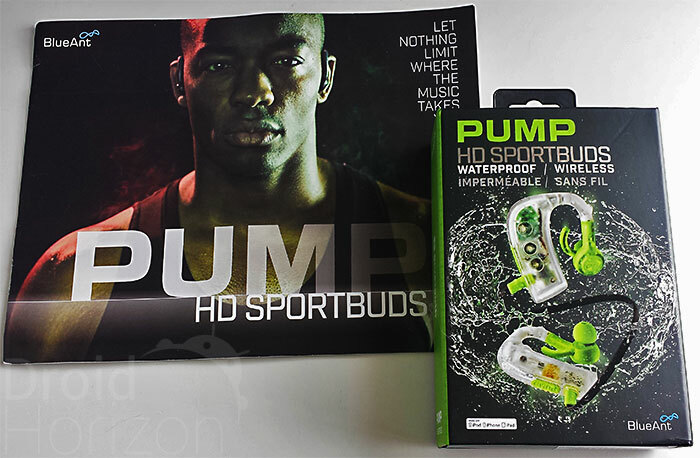 “Fully waterproof, completely wireless and utterly durable, these groundbreaking sportbuds redefine how we experience music. From the gym to the open trail and from the streets to the beach, nothing will limit where the beat takes you”. 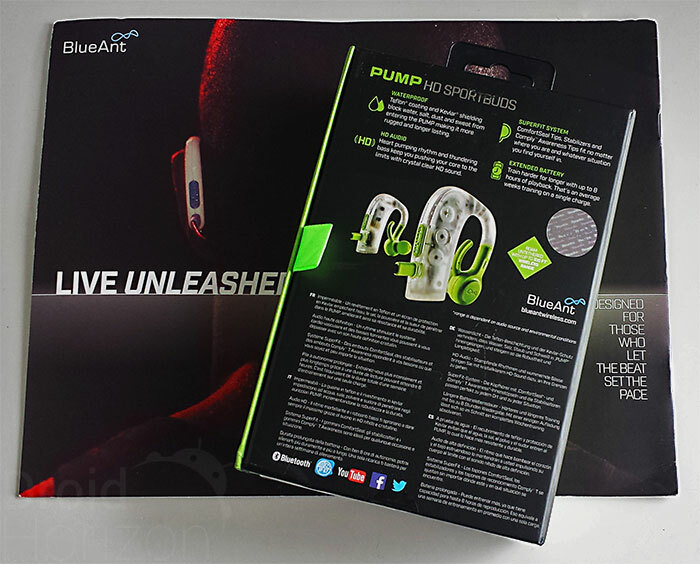 With bold claims like these, BlueAnt have a lot to live up to with their PUMP HD Bluetooth headphones – keep reading to see if they live up to the marketing. First of all – packaging. Although you’ll probably end up throwing it away, it’s what gives the first impression of a product. BlueAnt have obviously put a bit of effort into package design including tabs directing you how to open it and even magnetic latches. The headphones themselves are first on display, while underneath their packaging you’ll find a charging cable, stabilizers (more on those later) and a great selection of “Comfort Seal” ear-tips (4 each of small, medium and large sizes). There is also a pair of the spongy “Awareness Tips” designed to let in sound from the outside world – great when you’re running or cycling and that bus driver decides to play Speed. 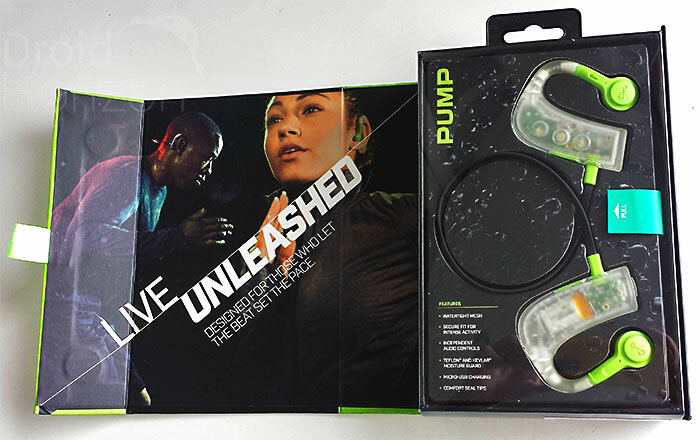 Available in a choice of 3 colors (blue, black and green ice) PUMP aren’t just your regular earphones – they have been designed with sport use in mind. A Teflon coating and Kevlar exterior give them both ruggedness and an IP67 waterproof rating. Therefore they should cope with rain, mud, sand, pool water or whatever bodily fluids you care to chuck at them. However as Bluetooth doesn’t transmit under water you’ll need to keep your head above water to keep listening to your tunes. To test their performance in the wet I wore them in the shower and they continued to work flawlessly (don’t worry – I did take them off to wash behind my ears). Being waterproof also has the advantage that if you do get them a little mucky you can just give them a rinse under the tap. 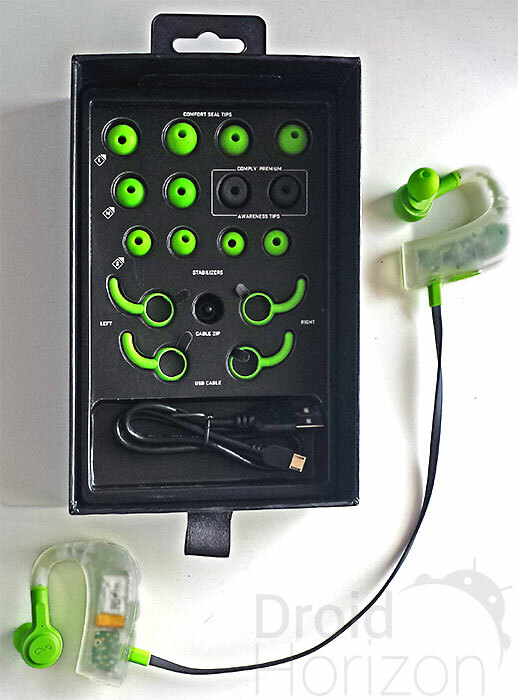 The sportsbuds themselves consist of two individual earpieces connected with a flat rubberized cable. The bulk of each earpiece rests behind the ear (hearing-aid style) with the cable running along the back of the head. If the cable is too long for your head / taste then there is supposed to be a clip included to tighten it to a snug fit but unfortunately this was missing from my review unit. I’m glad to say that although the cable was a little longer than the width of my head, it didn’t bother me in the slightest. In fact these are probably the most comfortable set of earphones I’ve tried. They are extremely light, and once you slide them over your ears and insert the tips you can easily forget they’re on. There’s no cable hanging down and no cross-bar to slide from the top of your head. The medium-sized tips were a good fit for me right out of the box and once inserted never slipped out unlike some other in-ear earbuds I’ve tried. I was able to wear them with glasses without any problems. You can pretty much carry on doing whatever you want to do without PUMP getting in the way. For an even firmer fit optional stabilizers are included which really lock each earpiece in place, but I found they did pinch my ears a little and were unnecessary unless you’re involved in extreme sports or violent head-banging. Pairing to my phone was simplicity itself, after which you’re free to roam around wirelessly. BlueAnt boast up to a 100 ft wireless range, and indeed I was able to keep on listening with very few cut-outs while far from my phone (compared to other Bluetooth devices I’ve tried) – even with walls and other obstacles in the way. This great range combined with on-ear controls means you should be able to leave your phone safe in your gym bag or locker while working out. On the right earpiece you have play, + and – controls. Tapping these while listening allow you to play/pause, increase or decrease volume. Hold the + or – for 2 seconds to skip tracks, hold play for 3 seconds to turn the unit on or off. The headset also includes a microphone so that when you get a call you can press the play button to answer / end calls or double-click it to reject calls or begin voice dialling. Voice dialling works pretty well and I was able to initiate a call, carry out a conversation and hang up, all without going near my phone. Call quality was clear on both ends of the line. When I hear a set of headphones are wireless and waterproof then my audio quality expectations aren’t particularly high. In this case the HD in the product name refers to “Energize HD Audio”, which BlueAnt market as an audiophile-grade music experience. While I wouldn’t class myself as an audiophile, I know what I like and I was impressed with the sound from these 12.5mm drivers. Producing a full sound with a strong (maybe a little overemphasized) bass, overall BlueAnt have not compromised the audio for the sake of headset’s other features. Volume-wise while PUMP were loud enough for my needs, but if you really like to crank your audio up and drown out noisy surroundings or if your source audio is on the quiet side then they do not get extremely loud. When no audio is playing on your device I did notice some background hiss. There’s no indicator for remaining battery life unless used with an iOS device, but when the battery runs low, a red light gives an occasional flash on the right ear-piece along with an alert tone played through the headset. You’ll then need to open up the rubber seal on the bottom of the left ear-piece and inside you’ll find a micro-USB port where you can plug the charging cable. That same red LED then stays constantly lit for around 90 minutes after which it switches to white to indicate that the unit is fully charged. According to BlueAnt you should then be good for up to another 8 hours of play time, but in my tests I found this to be closer to 5. If you’re going to give these heavy use then you’ll probably want to give them a quick charge every day. It’s difficult to recommend earphones to individuals because what may be a great look, fit and sound for one person could be terrible for someone else. However in my experience PUMP looked good, were comfortable and sounded great. Battery life was a little disappointing compared to some other Bluetooth headsets but apart from that it’s difficult to fault these great little headphones. Being waterproof and rugged is another bonus to an already competent headset, and makes the current Amazon price of $110-$121 (depending on your choice of color) well worth the asking price – especially if you need a decent pair for sports use.